William Sicilian Street Food is a family cosy restaurant in the heart of Northern Quartern, in Hilton Street crossing Tariff Street, few steps away from Stevenson Square. We moved to England 5 years ago and we noticed a lack of original flavours from Italy first and the complete absence of Sicilian food in the market. We miss our land so we decided to create something original and homemade. Our Sicilian Street Food comes directly from Sicily so both ingredients and recipes are authentic. We also serve famous Italian dishes like Lasagna Bolognese, Cannelloni Ricotta and Spinach, Veggie Lasagna, Spaghetti Carbonara, Spaghetti Bolognese and many other. A very small restaurant (only three tables, plus a few seats along one wall!). It is fun and quirky, with good food and lovely staff. If you want to eat somewhere really different, I would recommend this great little place. The atmosphere is warm, traditional and real feel of Italy. We had Arancin Ragu', Arancino Spinach ,Lasagna, Parmigiana homely food very reasonably priced as well. We cannot recommend enough, will return again. Amazing tiramisu'... Will definitely be back! Highly recommended. Consigliatissimo! Ho trascorso qualche giorno a Manchester, dove studia mia figlia. Abbiamo trovato questo ristorantino per caso su Opentable e l'esperienza e' stata assolutamente unica. Ci siamo innamorate dell'accoglienza Italian style, molto calda e colloquiale. Il cibo autentico e assolutamente eccezionale. Ho provato la Carbonara, da romana ero curiosa e posso dire che e' autentica con il pecorino romano e l'uovo al crudo, veramente buona! 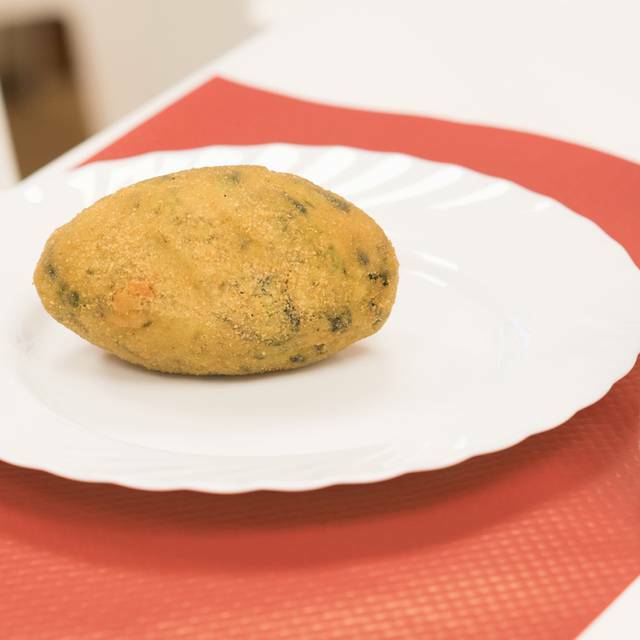 Come antipasto abbiamo preso gli arancini: Ragu' e Spinaci fritti al momento belli croccanti. Dessert Cannolo e Tiramisu'..che spettacolo. Il posto e' piccolino, accogliente molto verde ti mette allegria. Ci ha servito Rosa, una ragazza inglese, molto bella e coinvolgente..si vede che ama il suo lavoro..e probabilmente ama anche il cibo! Conosceva tutti i piatti molto bene e sapeva descriverli..penso li abbia provati tutti:-))) I prezzi sono molto contenuti. Mia figlia tornera' di sicuro con le amiche. What a find! This place is amazing. Authentic homemade Italian food plus Sicilian Rosticceria (Arancini, Cartocciate, Bombe, Cannoli, Treccie pistacchio, Iris). Delicious. 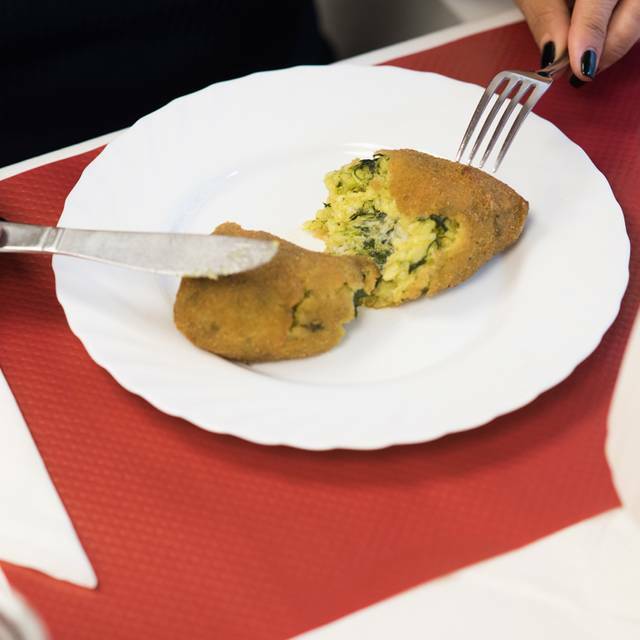 We tried Arancino Ragu' and Spinach as starters (fried at the moment) really crunchy with the cheese melted. I had Gnocchi alla Sorrentina, amazing and my boyfriend had Tagliatelle alla Bolognese. We finished with Tiramisu' (BEST in Manchester) and Cannolo Ricotta with pistachio flakes. I love William Sicilian Street Food. Nothing compared to that food in the city. Lovely, hidden, cosy gem at the back of Piccadilly. I booked because of the excellent reviews on Trip and food is amazing, delicious. Different from what you can find in the city, street food from Sicily is interesting.Homemade pasta very tasty. I had an arancini as starter and spaghetti bolognese as main and tiramisu to finish. Beautiful staff very welcoming. The restaurant is small but really cosy and pretty in terms of decorations. Soft lights, candle on the table and Italian traditional music that's make the atmosphere relaxed. The food was very poor quality, even though all we could hear was the food being warmed in a microwave the centre of my food was stone cold, hope you want parmesan all over your food as that is how it comes out the kitchen. Amazing Italian and Sicilian Food. Delicious food fresh and authentic. We tried Arancini first of all and lasagna as well, delicious. I can suggest also cannoli and tiramisu. We will come back for sure. Very quite and nice ambient. There was Rosa very friendly who explain to us all the dishes. It's a place done with love and passion you can feel it. Great Food really authentic recipe from Sicily, It's a little cosy place in the heart of Northern Quarter, parking is very easy and free in front of the Restaurant. Beautiful staff very friendly and helpful. I suggest to have dinner at William.